Hybridization of plants to suit the whims of gardeners has resulted in the proliferation of plants that lack both the nectar and pollen necessary for bees and butterflies. Add to this the catastrophic impact of genetically modified crops, herbicides, and pesticides, and we are today faced with a global food crisis that, if not corrected, will not only result in widespread famine but also the loss of fruit, vegetable, and nuts for consumption by humans and others, leaving us to forage on grains. Be sure to put water near the plants so the pollinators have enough to drink and make sure the water is not too deep or treacherous so that our winged cousins have safe places to land while drinking. Do not water the flowers themselves, but supply the water the plants need at the base of the plant, near the soil. These sunflowers are the type preferred by birds as well as for expressing oil. They grow about five feet tall and beans can be planted between them as the beans will run up the stalks of the sunflowers. This variety produces a very large seed head that matures in 60 days. 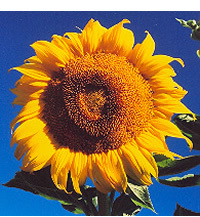 Sunflower can also be used to detoxify soil, including reducing the radioactivity from exposure to nuclear hazards.